A new study by researchers in India has found high levels of multidrug-resistant bacteria in and around Indian poultry farms. The study, published by the Centre for Science and Environment (CSE), a public interest research and advocacy group in New Delhi, collected samples from 12 randomly selected broiler poultry farms in four states with heavy poultry production. Antibiotic susceptibility tests of isolated bacteria showed that 100% of Escherichia coli, 92% of Klebsiella pneumoniae, and 78% of Staphylococcus lentus from the poultry environment were resistant to three or more classes of antibiotics. Some E coli and K pneumoniae isolates were resistant to 10 or more antibiotics. The study’s findings also suggest that multidrug-resistant bacteria are spreading from the poultry farms into nearby agricultural fields as a result of poor waste-management practices. For each farm tested, the researchers collected three types of samples: One sample of litter (poultry feces plus feathers and material used as bedding), one sample of soil from outside the poultry sheds, and one sample of soil from nearby agricultural land (where poultry litter was reportedly being used as fertilizer). The number of birds on the farms ranged from 3,000 to 21,000, and antibiotics were known to be used in poultry production, although data on antibiotic usage was not obtained. The researchers also collected, as a control, samples from soil about 10-20 kilometers from the farms. The isolated bacteria from the samples, chosen for their relevance to human health, were tested against 16 antibiotics from 13 classes, including antibiotics from seven classes deemed critically important by the World Health Organization. Overall, researchers collected over 217 isolates of bacteria for the study (187 from the poultry environment, 30 from control soil), with multiple isolates collected from all farm locations. Among the E coli isolates, 100% were resistant to meropenem, considered a last-resort antibiotic in human health, and more than 80% were resistant to co-trimoxazole, fluoroquinolones, and penicillins. High resistance was also observed to cephalosporins, including cefuroxime, cefotaxime, and ceftriaxone. About 40% of the E coli isolates were resistant to 10 or more antibiotics. Among the K pneumoniae isolates, very high resistance (more than 70%) was found against penicillins, fluoroquinolones, carbapenems, and cefotaxime, and high resistance (50-70%) was found against cefuroxime and ceftriaxone. Over 30% of the K pneumoniae isolates were resistant to 10 or more antibiotics, and 10% were resistant to all antibiotics tested. The S lentus isolates exhibited the lowest levels of antibiotic resistance, but were highly resistant to clindamycin and azithromycin. Resistance to penicillins and fluoroquinolones was in the range of 30-50%. Roughly 25% of S lentus isolates were resistant to at least eight antibiotics. To better understand the relationship between the resistance patterns inside and outside the poultry farms, the researchers then compared the resistance of samples isolated from the poultry litter with the resistance found in samples from the nearby agricultural soil. That comparison revealed very similar resistance to seven antibiotics among E coli isolates from litter and agricultural soil, and a strong statistical correlation. In addition, only three E coli isolates were recovered from the soil right outside the poultry sheds, compared to 13 found in the agricultural fields. The authors of the study say this finding is troubling because it suggests the litter is being used to fertilize the fields, and can easily spread beyond those fields. Khurana and his colleagues were not able to document a statistical correlation for resistance patterns in K pneumoniae and S lentus samples from litter and agricultural soil. In addition, they didn’t find similar resistance patterns in the control soil samples. The study adds to concerns about the widespread use of antibiotics in Indian poultry production and the role it’s playing in rising levels of antibiotic-resistant bacteria. In July, a study in Environmental Health Perspectives found high levels of antibiotic resistance in chickens raised for meat and eggs on 18 large commercial farms in Punjab, India. Of the 1,556 E coli isolates tested in that study, more than half were found to be multidrug resistant. Another study, published in Microbiology Research, found that more than 80% of Salmonella isolates in ready-to-cook poultry products purchased at stores in Mumbai were multidrug-resistant. Unlike the European Union (where use of medically important antibiotics for growth promotion and disease prevention is banned) and the United States (which has instituted a voluntary ban on use for growth promotion), India does not regulate any antibiotic use in food animal production. Use of medically important antibiotics for non-therapeutic purposes is widely considered to contribute to the development of antibiotic resistance in humans. But with heightened demand for food animal products in South and Southeast Asia, the use of antibiotics in sub-therapeutic concentrations is rising. In April, India’s health ministry launched the National Action Plan on Antibiotic Resistance, a document that aims to tackle antibiotic misuse in the country’s human and animal health sectors. The plan proposes phasing out non-therapeutic antibiotic use in food-producing animals. Based on the findings of their study, the CSE recommends that use of antibiotics for growth promotion and disease prevention in food-producing animals be prohibited, and that antibiotics that are critical for human health not be used at all in animals. 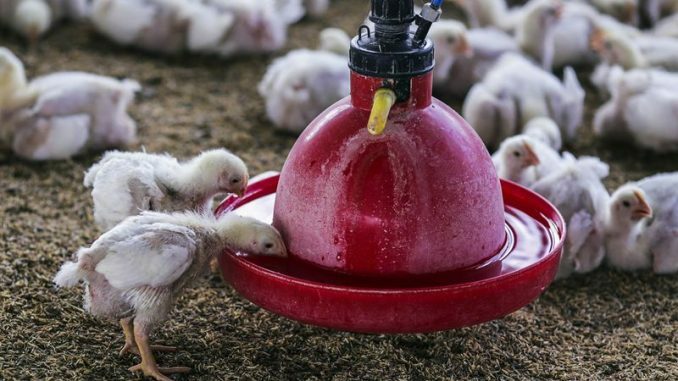 To reduce the spread of antibiotic resistant bacteria from farms into the environment, the report urges regulators in charge of the country’s waste management to adopt environmental regulations and standards aimed at reducing pollution from the poultry farm sector. Among the suggestions to improve manure management are converting litter into gas (biogas generation), rather than spreading it onto agricultural fields. The authors also say litter should not be used as feed for fish in aquaculture facilities.